"Buying used Android phones can save you a bunch of money, but there are a few things you should check out before forking over your hard-earned cash." 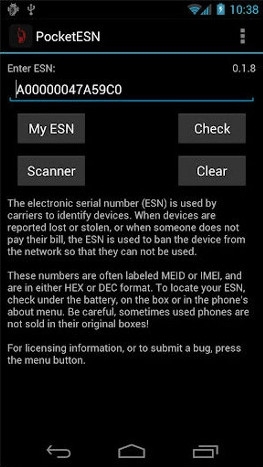 PocketESN is an app that will let you check to make sure a phone was not stolen or anything like that. For free it will check the status of the phone it's installed on. The paid version, for $5.99, will let you check the status of as many phones as you want. It requires an internet connection to work but it can be over WiFi so you can do this before activating the phone and having the police come after you for buying a stolen one. PocketESN should work with any CDMA Android phone. I don't usually recommend buying used phones since these days you can usually get a good new phone for free or nearly so under contract. Also, with a new phone you get a new battery and that alone is sometimes worth what you pay over a used phone. Still, there are definitely deals out there if you're willing to buy used.